Back at the start of Spring I was lucky enough to spend an afternoon getting to know the team at Welton’s brewery in Horsham. Now, as the Autumn is pressing in, I have found my way back, spending a few hours at the brewery with Alex Welton and Wayne Frost and joined by Clive Walker of Horsham Pub Guide. The brewery have been typically busy, brewing up multiple seasonal brews over the summer. 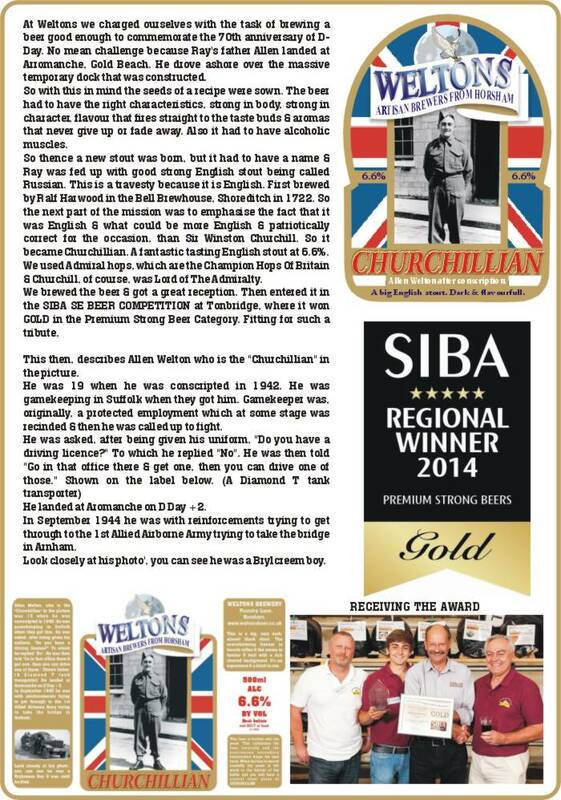 The aim of the afternoon is to get acquainted with their Churchillian Stout, a recent winner of a SIBA Gold Award for Premium Strong Beer and deservedly so, but we’ll get to that later, as there are plenty of other beers to warm up with. We start with a 100 Litre Sprint, a 4.2% amber ale with a pronounced citrus kick- lots of grapefruit pithiness and lemon zing. A very vibrant cask ale full of summery hits. Next up is Hurricane, a 4.1% bitter brewed with lager malts, Zeus and Styrian Goldings. A nicely carbonated beer and a hoppier beer than the first, yet still neatly balanced with hits of peach and candy partnering a rounded caramel and leading toward a peppery kick in the finish. Schooner Blond steals our attention, a 4.6% blond ale boasting a sweet malt aroma with honey sweetness on the palate alongside chewy dates and dried fruits, leading into a dry and pithy finish. A lovely mouth-feel to this one. I’d love to see this make it to bottles- an easy ‘go-to’ beer. So now the stouts come into play, pouring Marathon Stout, a 5% party of pale malt, wheat and toasted oats. Roasted hits upfront are accompanied by a sweet edge. A more-ish supper that leads into a slightly smoked finish with notes of tobacco. All beers up to this point have been straight out of the cask, but now a bottle is produced and it’s time to try the main event, the beer that won the gold award, the stout they want to shout about; Churchillian. The bottle in question is aged 4 months, and pours a sublime treacle-black. This is a 6.6%, full bodied stout with all the characteristics you’d want- smooth chocolate, espresso, a cindered quality and a hugely dry, roast finish, all with a surprising and very pleasant cherry edge. I’ve been given a bottle to age for a further 6 months, if I can wait that long, it’ll be exciting to see how decadent and complex those flavours can become. In my opinion Welton’s brew best when they’re brewing stouts and this is pretty much everything I want from the style. Other exciting developments at the site have included a new beer brewed for the Horsham Beer Festival- typically strong, this year’s special brew is Hammerpond Dark, a whiskey barrel aged stout that promises dark fruits and treacle hits. The team are also considering a 15 barrel carbonation kit, with the potential to keg their core beers. This would definitely be a plus for the local beer scene, personally I’d like to see more Sussex brewers experimenting with kegged beers and it would certainly be great news for the more rural pubs in the area, allowing for a longer holding period on the beers. Add to all this their continued expansion into Kent & London and Welton’s certainly are winning. With thanks to Wayne and Alex for the tour and tastings. I managed to forget about that bottle of Churchillian for 6 months, ageing it at the back of the pantry, letting those roasted malts and fruit hits mellow. It made for a noticeable difference, the chocolate edge was more distinctly dark chocolate and whilst the heavily roasted cinder-like malts were still in force they had mellowed and become a bit more complex. The fruity cherry-like edge that had surprised me the first time around was, perhaps not surprisingly, the most different element to the aged version. Whereas the 4 month aged bottle showcased a juicier, fresher fruit hit this 12 month aged bottle gave away a more syrupy sweetness like a rich cherry jam. This is a stout that I will continue to happily drink fresh, but I’ll be sure to stash a few bottles away again too.